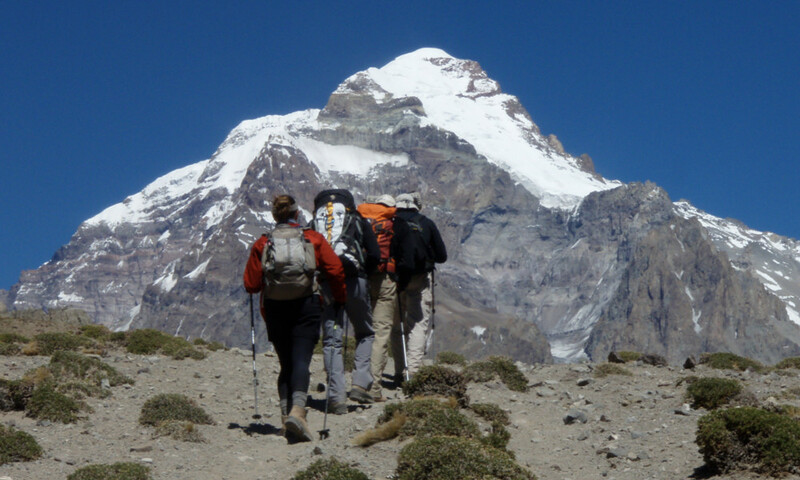 Discover an incredible climbing experience for individuals seeking the challenges of a high altitude climbing expedition in a spectacular setting by climbing Aconcagua, situated in the heart of the Andes of Argentina near the border with Chile. We offer expeditions on four different routes to climb Aconcagua, including ascents from the Upper Vacas valley on the mountain’s remote northern side. In the past, this has proven to be a scenic and seldom traveled route. It is a high-quality, non-technical climb in a pristine environment. We also lead technical climbs on the Polish Glacier. We would be happy to talk with you about the different route options. All of our Aconcagua expeditions begin and end in Mendoza, Argentina. After meeting your MGI guides upon arrival at the airport and checking in with the permit office in town, we head up to Penitentes at 9,000 feet (2,750m), our gateway to the mountain. We lead three different routes up Aconcagua. Each route is supported by mules to base camp and incorporates a conservative acclimatization schedule, allowing ample extra days for a successful summit day. From Penitentes, our primary route on Aconcagua begins in the substantially less traveled Vacas valley on the east side of the mountain. 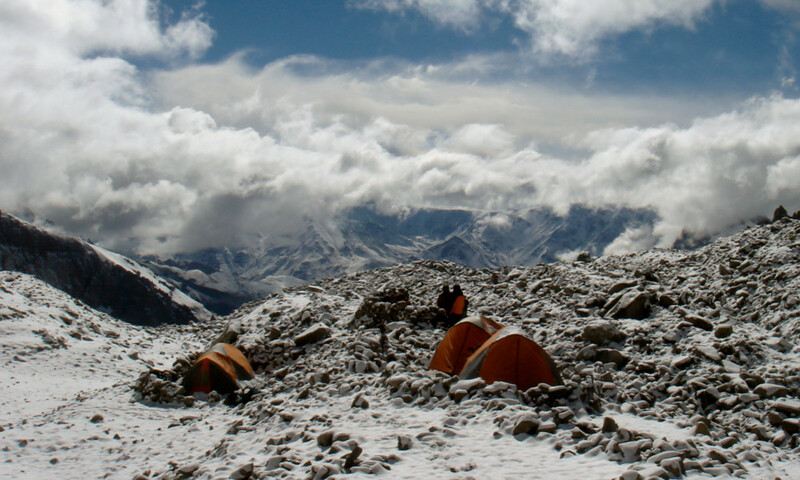 The three day approach brings us to Plaza de Argentina, the smaller and quieter setting of the two major basecamps. From this camp the route ascends along a variation of the False Polish Traverse route on the north east side of the mountain and descends via the normal route on the west side. These two routes meet at high camp, which means you will need only to carry a light pack on summit day. The traverse style route offers unmatched views from all sides of the mountain and sees only about 10 to 15% of the traffic that the normal route encounters. 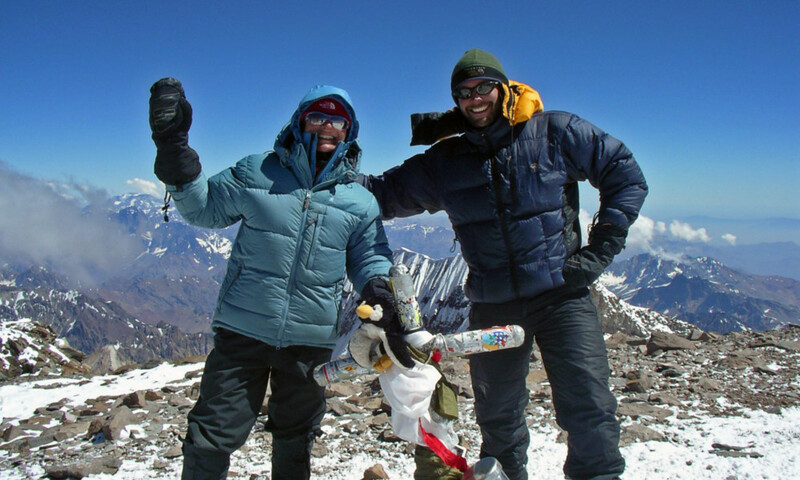 Since 1992, we have had one of the highest summit success rates on Aconcagua. Over the past 5 years, we have enjoyed a 100% expedition success rate and over 91% success rate for all team members. This high percentage is due to our conservative itineraries, acclimatization schedules, small group size, and world class guide team. With over 150 Aconcagua expeditions in the past 20 years and a perfect safety record, MGI is the number one guide service on Aconcagua. Sean Gaffney, president of MGI, was the first to pioneer the route up the remote Upper Vacas Valley. Additionally, our extensive experience of leading high altitude mountaineering expeditions on all seven continents contributes to a safer and more successful climb on Aconcagua. 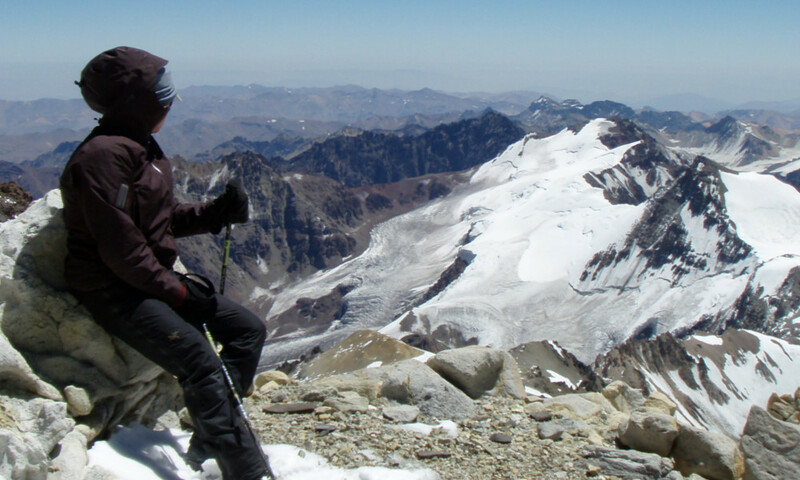 OUR GUIDES: Our Aconcagua guides have extensive experience on the mountain. Their skill and knowledge insure a safe, successful, and fun trip. We also limit the size of our groups and maintain a small guest to guide ratio. The itineraries and camps that we use are designed to provide the best experience on this challenging and rewarding trip! MENDOZA: Our trip will begin and end in Mendoza, located in Argentina on the east slope of the Andes. It is the third largest city in Argentina, in the heart of the local wine country and the climate is hot and sunny. There are many great restaurants to try, as well as some of the world’s finest vineyards to take a winery tour during your free time. PENITENTES: We’ll spend the first night of our trip at Penitentes, the staging area for Aconcagua Expedition. A welcome dinner at the hotel Ayelen along with comfortable rooms are included in the cost of this expedition (alcohol not included). VACAS VALLEY: A unique route for climbing Aconcagua. It follows an isolated valley to the remote North side of the mountain. It is a beautiful route with lots of wildlife. This route was pioneered by Mountain Guides International Director Sean Gaffney, and we have been guiding it for many years. 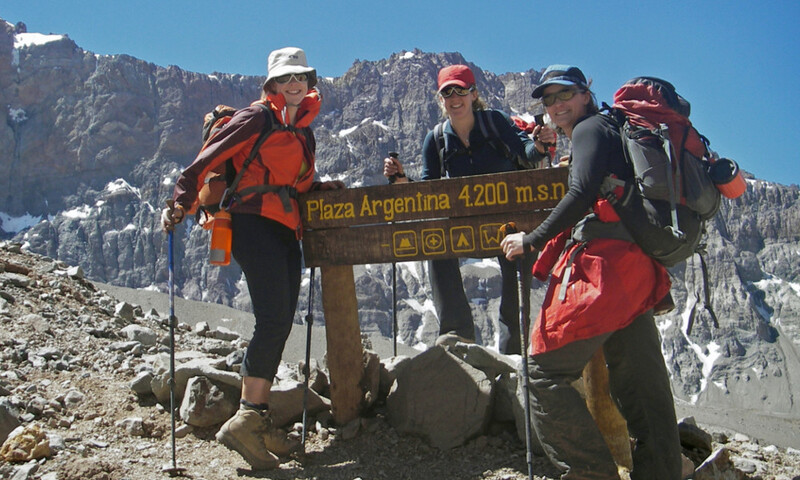 SIDE TRIPS: Climbs of Aconcagua can easily be combined with local rafting trips or trekking in Patagonia. We would be happy to answer any questions about options for side trips while you are in Argentina or Chile. DIFFICULTY: Most routes are non-technical, but involve strenuous hiking at high altitude carrying a 50 – 60 pound backpack. Our most popular route to climb Aconcagua is via the Vacas 360 route. We ascend through the Vacas Valley, with views of Aconcagua’s east face and the Polish Glacier, before descending down the Horcones Valley to Plaza de Mulas. 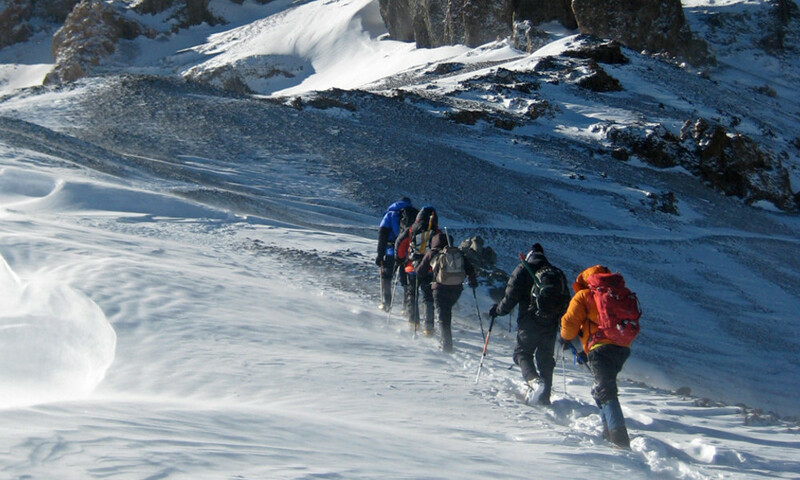 Our 20 day itinerary has several days built in to accommodate bad weather and the need to acclimatize to high altitude. What skill level is required for this climb? The primary route used by MGI is non-technical and no formal mountaineering training is required. 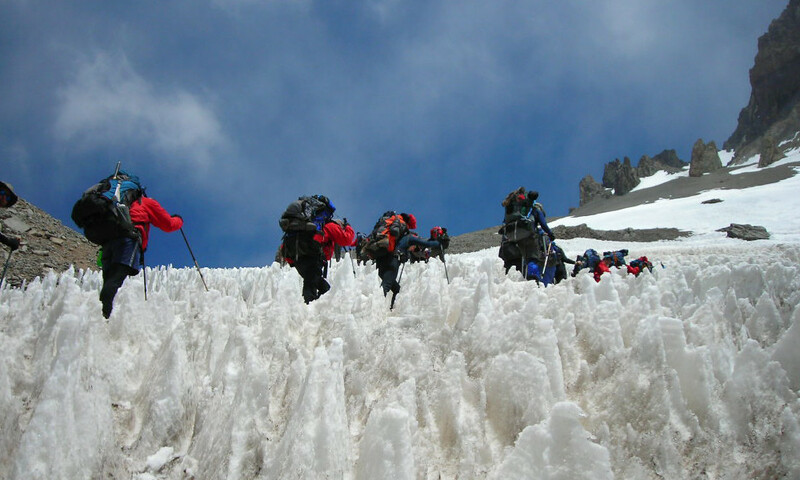 Climbing Aconcagua does expose individuals to high altitude where most find ordinary tasks more trying. Thus familiarity with higher elevations as well as having a solid grasp on the various elements of cold weather backpacking and trekking will prove to be most beneficial. Basic ice ax and cramponing is also a plus, but we’ll have time on the mountain to review these skills. We recommend bringing at least $400 cash or travelers checks for Mendoza hotels, restaurants, gifts, and travel after our climb. If you intend to utilize porter support you should budget approx. $2,000 extra and bring this with you on the climb. Porters work for cash on hand and take payment from you directly when rendering a service. Your guides will help arrange porters for you if you’d like. All trekking is moderate, progressing to difficult at higher elevations. The trail is rocky all the way to the summit, unless there is snow. Trekking days are usually four to eight hours long, in some cases climbing up to 2500 feet in a day. In general the weather is warm and sunny on the approach hike days! On most routes the climbing is basic level scrambling, with potential for basic snow/ice climbing, depending on the current conditions. The climbing on the Polish Glacier route is demanding, steep, and exposed. It is a serious route that needs to be in the right condition to be safe. MGI will rarely book more than 8 on a climb. Exceptions for private trip itineraries may be made and are welcomed. Typically a group has between 6 to 8 climbers. Argentina is a beautiful, lively, country located at the bottom of the South American continent. It is home to many diverse climatic and geographical regions. 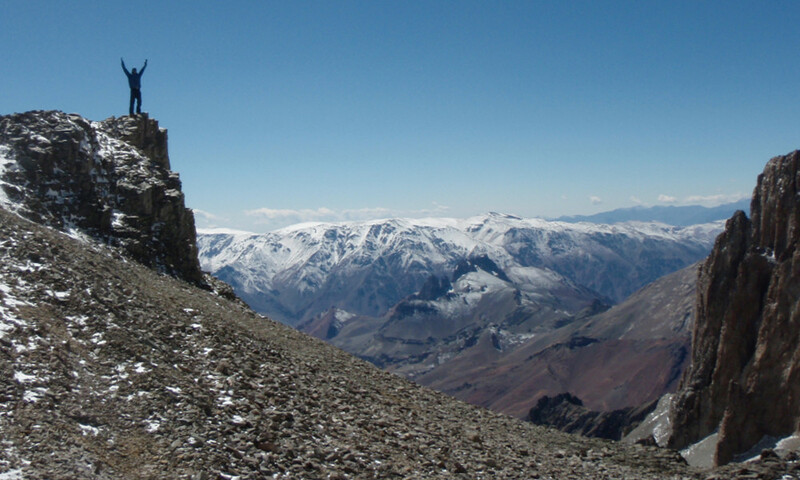 Aconcagua is located on the country’s western edge, near its border with Chile. Mendoza is the starting and ending place for our trip. It can easily be reached by daily flights from both Buenos Aires and Santiago. Mendoza is a colorful city of approximately 500,000 people full of interesting history, markets and parks. It is located in the heart of Argentina’s wine country and the climate is predominantly hot and sunny! Make certain that your ticket matches the full name on your passport. Plan your arrival in Mendoza not later than the day before the first scheduled day of the trip. This provides leeway for any flight or baggage connection trouble. Please make certain that we have your flight and arrival information so that we can meet you at the airport! Make certain to reconfirm your flights. Most flights go through LA, Dallas, or Miami, to Santiago Chile, and then connect to Mendoza. It is also possible to schedule flights through Buenos Aires, Argentina. Over the past few years the Argentina the exchange rate has been around 16 pesos to one US dollar. Traveler’s checks and cash are both easily exchangeable. ATM’s with the Cirrus network are widely available and work well. You can usually withdraw up to $250 a day from your account, check with your bank before traveling. From Mendoza we will take a private van for the scenic three-hour drive through the Andes to the lodge at Penitentes. Mendoza is warm at this time of year, with daytime temperatures generally in the 80’s and 90’s. While trekking temperatures can vary from warm days to cooler nights, and high on the mountain temperatures can reach -25 F.
Climbing Permit – Guide to obtaining your climbing permit. Why MGI – Why MGI stands above the rest. Hotels in Puente del Inca. All meals from Mendoza to Mendoza. Group climbing and camping equipment. Bottled water, soda, and alcohol. Food & Lodging in Mendoza- we would be happy to recommend lodging options. Climbing Permit – review the “Climbing Permit” PDF under “Documents”. I want to take this opportunity to say how impressed I was with Tom. I was confident in his ability to keep us as safe on the mountain. He just had the right mix discipline and sternness to keep us in line and humor to keep our spirits up. And to top it off he was a great cook. I also want to complement Jonathan who was the consummate professional. His knowledge and ability to deal with the situations that came up were impressive. I was confident that if a bad situation came up that Tom and Jonathan could deal with it. Thanks guys! The guides were great. They both exhibited very professional behavior and were a great source of knowledge, and on top of that they were very personable. The only criticism that I have is that they were pretty bad at playing cards :). I would not hesitate to do another expedition with them again, and I have already recommended your business to others that are thinking of doing this sort of thing.